What is a Catalina or as we call it a “cat”? 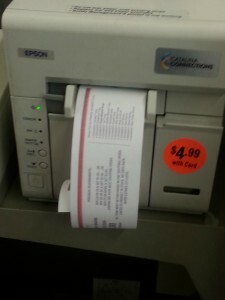 a Catalina is a coupon that prints from it’s own printer, that is for a certain amount off your next order or as we say (OYNO). You cashier will give you your cat, when they hand our your receipt. And, you will want to keep this coupon until your next trip to the store. Just remember when you are redeeming your cats, that you cannot roll them. Meaning that you cannot get a Catalina and then turn around and use it to do the same deal again. So, you need to use it on a different item. Sometimes, Catalina’s fail to print. If yours doesn’t print you can either fill out the form HERE, or you can contact Catalina Marketing Company at 1-888-826-8766. Have you found a Catalina that I don’t have listed? Or, has a Catalina that I have listed stopped printing? Be sure to let me know about it. You can contact me below!